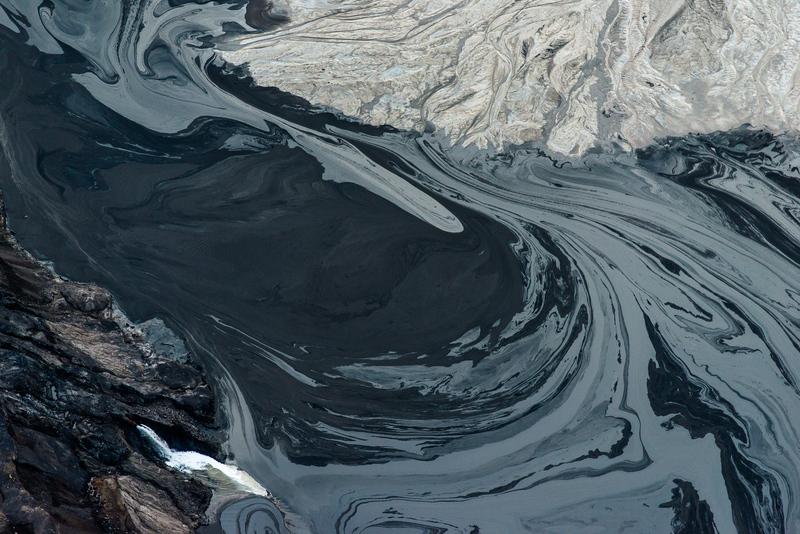 Industrial landscape: Canada's Tar Sands: Effluent pipe and bitument swirl. Alberta Tar Sands, Northern Alberta, 2013. Effluent pipe and bitument swirl. Alberta Tar Sands, Northern Alberta, 2013. Effluent pipe and bitument swirl. Alberta Tar Sands, Northern Alberta, Canada, 2013. A small section of a tailings pond shows the effluent pipe which flows 24 hours a day and the swirl of black bitumen residue which flows from it. So large are the Alberta Tar Sands tailings ponds that they can be seen from space. It has been estimated by Natural Resources Canada that the industry to date has produced enough toxic waste to fill a canal 32 feet deep by 65 feet wide from Fort McMurray to Edmonton, and on to Ottawa, a distance of over 2,000 miles. Nikon D800E. 70-200mm f2.8 shot at 190mm, ISO 800, 1/1600 at f4.5 Alberta Tar Sands, Northern Alberta, Canada.